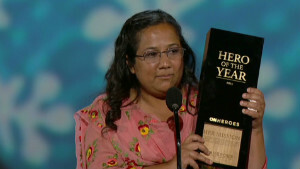 (CNN) -- Pushpa Basnet, a Nepalese woman who supports children so they don't have to live behind bars with their incarcerated parents, was named the 2012 CNN Hero of the Year on Sunday night. Nepal is one of the poorest countries, and space is very limited in the few group homes affiliated with the government. So when a parent is incarcerated and no other guardian can be found, children have little choice but to live in prison as well. 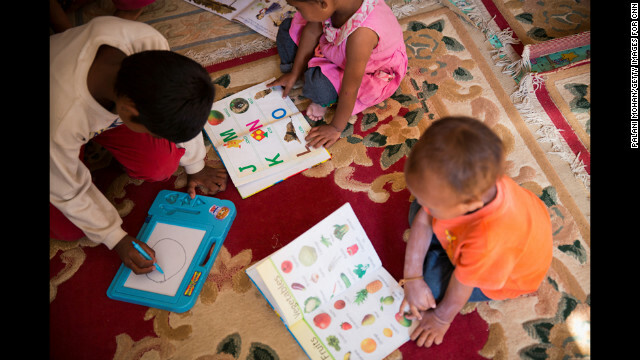 Basnet, 29, is determined to give these children another option. 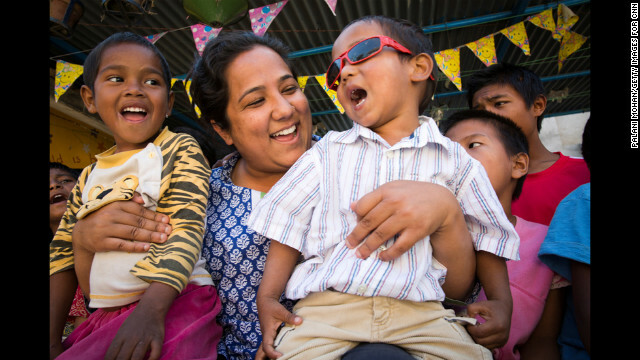 She started a home in Kathmandu where children can receive education, food, medical care and a chance to live a more normal life. She also runs a day care program for children who are too young to be separated from their parent. "These children have done nothing wrong. They are simply caught in something they do not understand," Basnet said during "CNN Heroes: An All-Star Tribute," which took place at the Shrine Auditorium in Los Angeles and honored her and the other top 10 CNN Heroes of 2012. "We want to work with the government to bring them all out from of prison. And they deserve a better future." 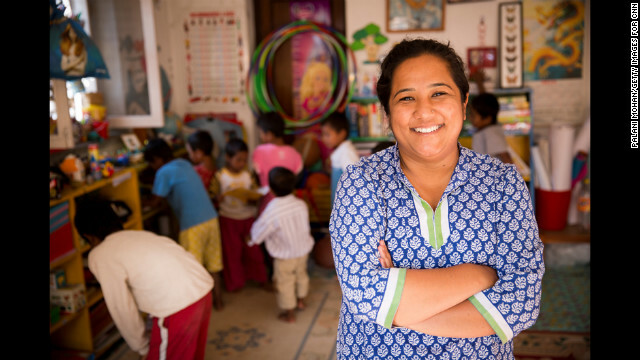 Pushpa Basnet, the 2012 CNN Hero of the Year, was shocked to learn that many children in Nepal had no choice but to live with their incarcerated parents behind bars. So she started a day care program for many of these children and opened a home in Kathmandu where dozens of them can live a more normal life. When Basnet hears about an imprisoned child, she'll visit the prison, even in remote areas of the country, and tell the parent what she can provide. 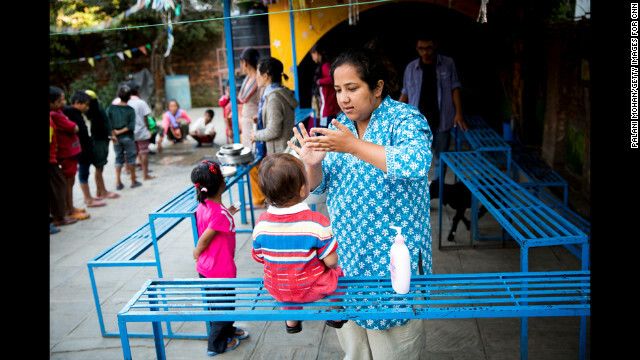 If the parent agrees, Basnet brings the child back to stay with her and her staff at the Butterfly Home in Kathmandu. 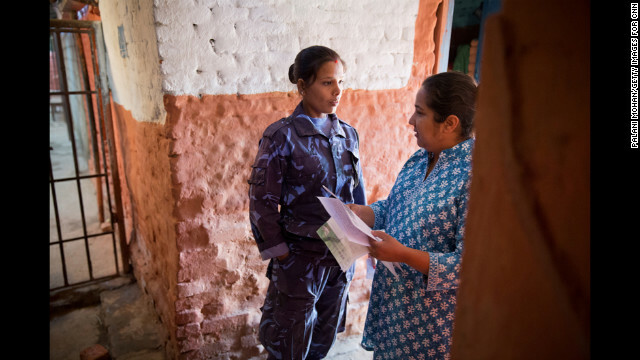 Basnet talks to a female prison guard to gain permission to go inside a jail in Kathmandu. Basnet was studying social work in college when she first visited a women's prison and discovered how many children had to live there. A woman at a prison in the town of Nuwakot cries after sending her child away with Basnet. Basnet wants the children to maintain relationships with their parents, so she often takes them back to visit. Ultimately, the goal is to reunite the families outside prison. 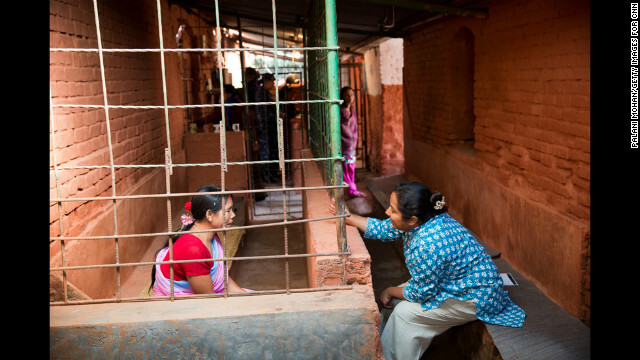 Basnet talks to an inmate in Kathmandu. "Meeting and spending time with the children and the mothers in jail, you realize that Pushpa is their only hope," said photographer Palani Mohan. 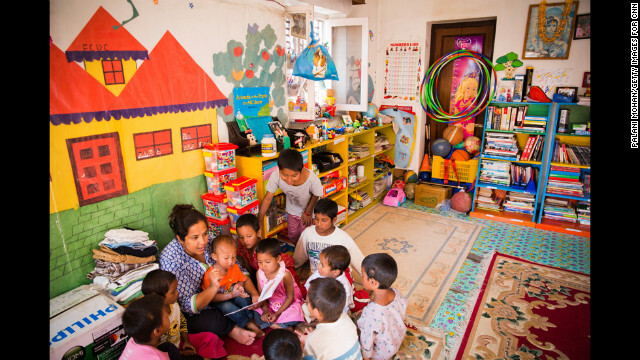 Since 2005, Basnet and her staff have assisted more than 140 children, providing housing, education and medical care. "When I started, nobody believed in me," Basnet said. 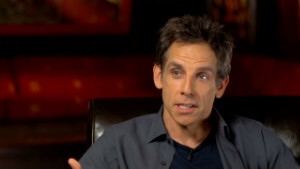 "People thought I was crazy." "It's not fair for (these) children to live in the prison, because they haven't done anything wrong," Basnet said. "My mission is to make sure no child grows up behind prison walls." Basnet reads to some of the children at the Butterfly Home in Kathmandu. "I don't ever get a day off, but if I [didn't] have the children around me, it would be hard," she said. "When I'm with them, I'm happy." Nepal is one of the poorest countries in the world -- according to UNICEF, 55% of the population lives below the international poverty line -- so it lacks the social safety net that exists in most Western nations. 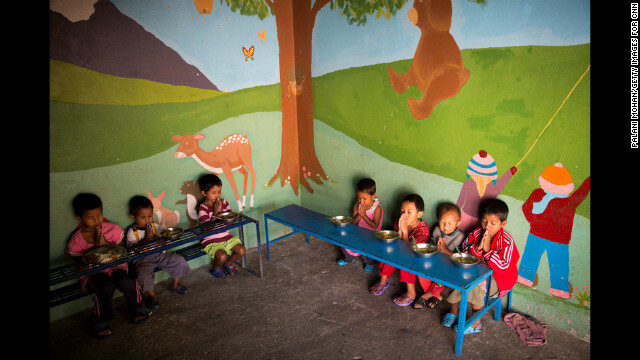 Children at the Butterfly Home say a prayer before eating lunch. Dozens of children live at the home with Basnet and some of her staff members. Basnet hands out new clothes to one of the young children she cares for in Kathmandu. The children reciprocate her love by calling her "Mamu," which means "mommy." "The first thing you notice about Pushpa is her huge smile to welcome you," photographer Mohan said. "She's full of energy. She has this incredibly booming voice that never stops all day, all night." Basnet applies moisturizer cream to one of the children in Kathmandu. "This is what I want to do with my life," Basnet said. "It makes me feel (good) when I see that they are happy, but it makes me want to work harder. ... I want to fulfill all their dreams." Pushpa Basnet was shocked to learn that children in Nepal were living in prisons with their parents. In 2005, she started a children's center that has provided housing, education and medical care to more than 140 children of incarcerated parents. "I always had a dream to build our own home for these children, and I want to rescue more children who are still in prisons," Basnet said. 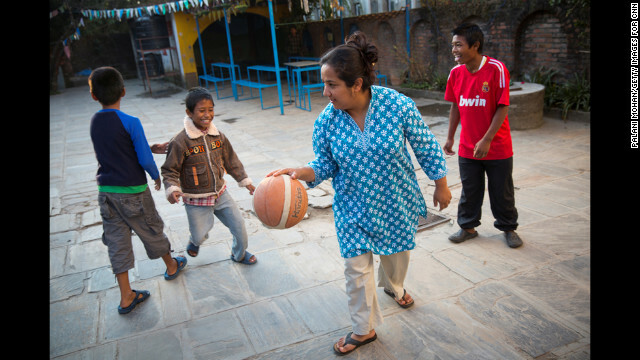 See more photos of Pushpa Basnet, who was voted CNN Hero of the Year for 2012. 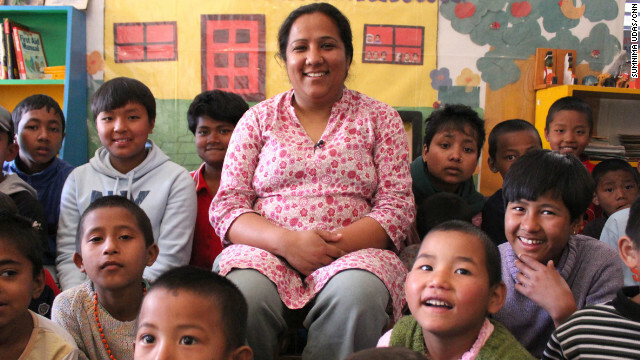 Since 2005, Basnet has helped more than 140 children through her nonprofit, the Early Childhood Development Center. Basnet was chosen as Hero of the Year through a nine-week public vote held on CNN.com. For being named CNN Hero of the Year, she receives $250,000 to continue her work. That is in addition to the $50,000 that each of the top 10 Heroes are receiving. When accepting the Hero of the Year award, Basnet relayed a message to incarcerated children in Nepal. "Mamu's going to take you out from the prison, and you're coming to my place," said Basnet, who is called "Mamu" by many of the children. "This is for my children, and this is for my country Nepal. 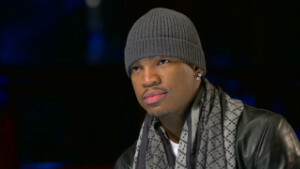 Thank you so much everybody who voted for me and who believed in my dream." 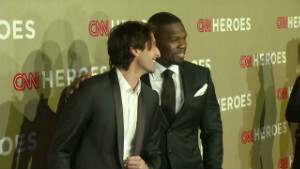 This is the sixth year of the CNN Heroes campaign. 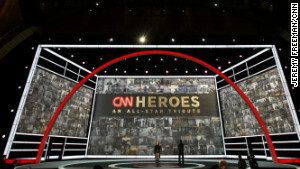 In that time, more than 180 CNN Heroes have been profiled on CNN, chosen from more than 45,000 nominations submitted through the CNN Heroes website. Each year, the campaign culminates with a live tribute show that brings together some of the biggest names in the entertainment industry. The celebrities who took part in this year's show included movie stars Susan Sarandon, Adrien Brody, Maria Bello, Viola Davis, Harvey Keitel and Josh Duhamel; athletes Jeff Gordon and Cullen Jones; and hip-hop artist 50 Cent. Television stars Rainn Wilson ("The Office"), Rico Rodriguez ("Modern Family"), Jane Lynch ("Glee"), Miranda Cosgrove ("iCarly") and David Spade ("Rules of Engagement") also participated. There were two musical performances during the show. "American Idol" winner Phillip Phillips performed "Home," and three-time Grammy Award winner Ne-Yo sang "Heroes." Donate to a top 10 Hero's designated nonprofit, and Google will waive 100% of the transaction fees. 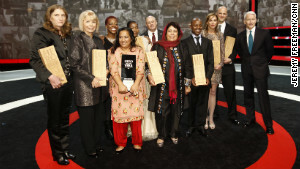 Subaru is proud to have matched contributions of $50,000 to the 2012 Top 10 CNN Heroes. Your contribution matters. Please help these everyday people change the world. In addition to receiving $50,000, this year's top 10 Heroes will also receive free training from the Annenberg Foundation, a leading supporter of nonprofits worldwide. Each Hero will receive a customized version of the Annenberg Alchemy program, which provides practical guidance on fundraising, communications, management and much more. "We have found that the most effective nonprofits are like the CNN Heroes -- organizations with strong and visionary leaders and a bold, new approach to getting the job done," said Wallis Annenberg, the foundation's president, CEO and chairman of the board. "Our hope is that in supporting them -- especially smaller nonprofits, still struggling to survive and to thrive -- we will help them get wider attention and become models across the world." Pushpa Basnet was shocked to learn that many children in Nepal have to live in prisons with their parents. In 2005, she started a children's center that has provided support, such as housing, education and medical care, to more than 140 children of incarcerated parents. 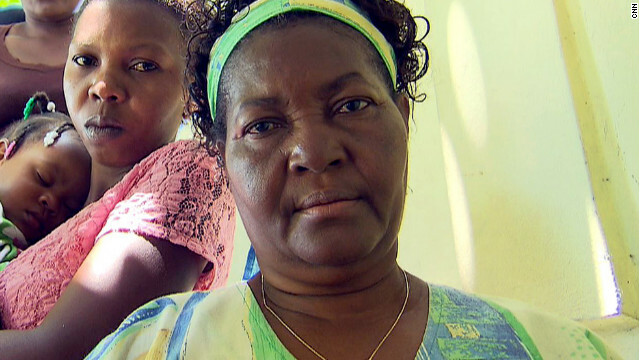 Wanda Butts lost her son in a drowning accident six years ago. In his memory, she started the Josh Project, a nonprofit that taught nearly 1,200 children -- most of them minorities -- how to swim. 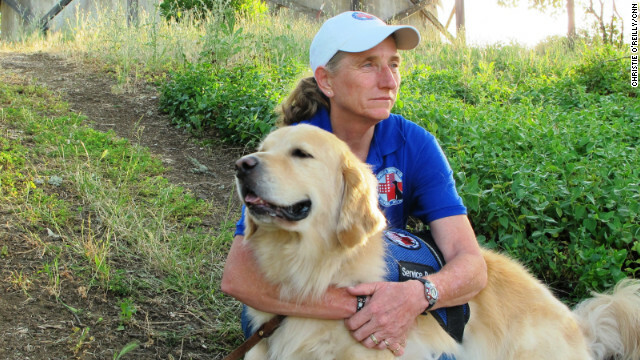 Mary Cortani is a former Army dog trainer who started Operation Freedom Paws, a nonprofit that helps war veterans train their own service dogs. Since 2010, she has worked with more than 80 veterans who have invisible wounds such as post-traumatic stress disorder. Catalina Escobar is helping young moms in Colombia, where one in five girls age 15-19 is or has been pregnant. Since 2002, her foundation has provided counseling, education and job training to more than 2,000 teenage mothers. Razia Jan is fighting to educate girls in rural Afghanistan, where terrorists will stop at nothing to keep them from learning. She and her team at the Zabuli Education Center are providing a free education to about 350 girls, many of whom wouldn't normally have access to school. 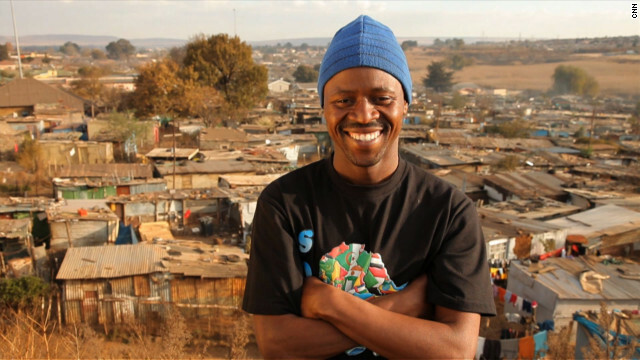 Thulani Madondo struggled as a child growing up in the slums of Kliptown, South Africa. Today, his Kliptown Youth Program provides school uniforms, tutoring, meals and activities to 400 children in the community. In memory of his daughter who was killed by a drunken driver in 2007, Leo McCarthy started Mariah's Challenge. The nonprofit gives college scholarships to teenagers who pledge not to drink while they're underage. 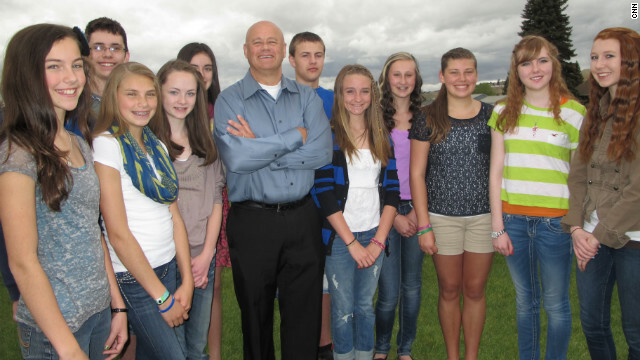 Nearly $150,000 in scholarship money has been awarded. 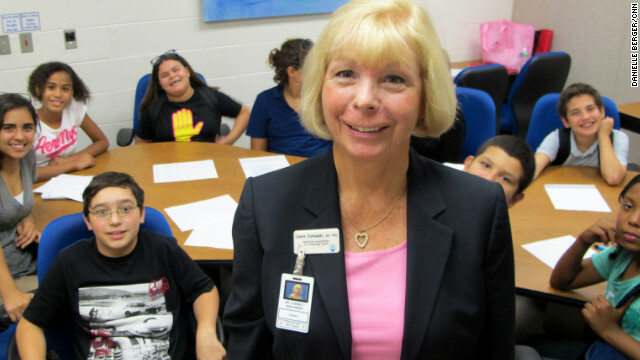 Connie Siskowski is helping young people who have to take care of an ill, disabled or aging family member. Since 2006, her nonprofit has provided assistance to more than 550 young caregivers in Palm Beach County, Florida. After beating his addiction to drugs and alcohol, Scott Strode found support through sports. Since 2007, his nonprofit, Phoenix Multisport, has provided free athletic activities and a sober support community to more than 6,000 participants in Colorado.